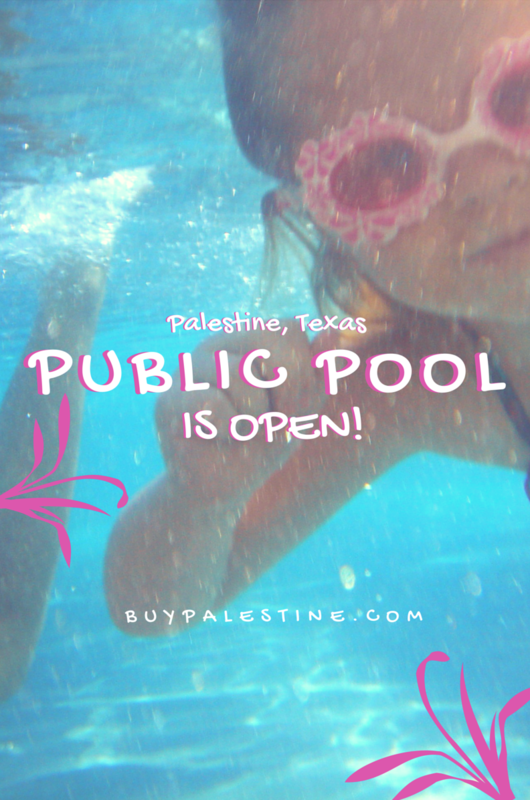 Palestine Real Estate & Palestine TX Homes For Sale | BuyPalestine.com Palestine TX Public Pool is Open! Palestine TX Public Pool is Open! Palestine TX Public Pool is Open! June 6th is first official day! Hello Summer! I have missed you! Time for BBQs, flip flops and swimsuits (eek! lol!) Palestine TX Public Pool is Open! …and it is FREE for Palestine City Residents! The time has come for the City of Palestine residents to bring out their swimsuits and jump in Steven Bennett pool for FREE again this summer! How much is it? Where to pickup pass? 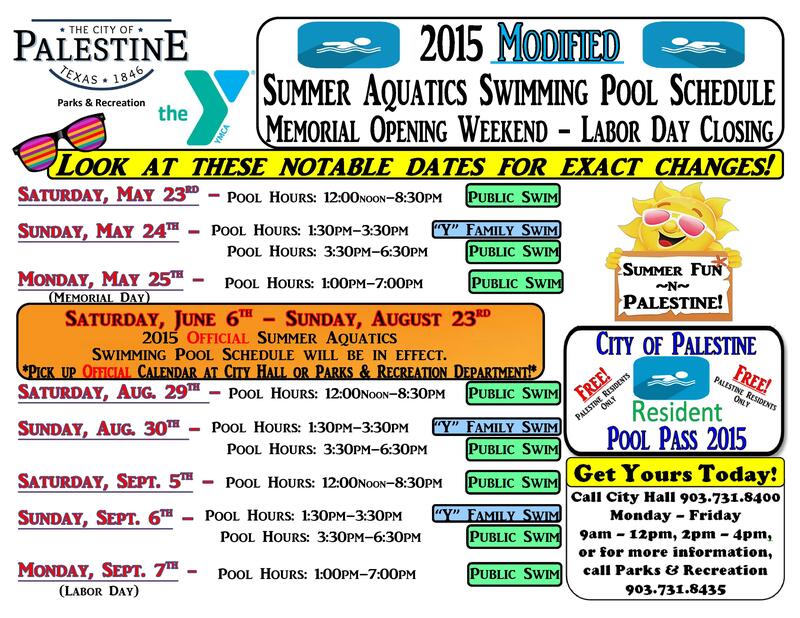 Pool passes are FREE for Palestine City residents. Pool passes can be picked up at Palestine, TX City Hall (504 N. Queen, Palestine, TX 75801). Pool pass pickups are from Monday–Friday 9am-Noon and 2-4pm daily. City residents will need to bring a copy of their water bill and an ID. Keep in mind that pool passes will only be given to the person listed on the water account. If the account holder can’t pickup, call and add a user to the account for pickup. Renters with water paid by landlord are eligible too–just bring in a copy of your lease. Replacement pool passes are $30 for the first lost pass and $60 for the second and beyond. Non City residents can purchase a 2015 pool pass for $60 for a family of 6. The pool hours are not the same every day, so be sure to check your dates and times before going to the pool! Below is a general pool schedule for the 2015 season, but it wouldn’t hurt to call and double check before going if you are unsure. There are a few days where the hours change. Official Pool Schedule – Starts June 6th! 2015 Official Pool Schedule June 6- Aug 23rd. CLICK TO ENLARGE. Image courtesy of The City of Palestine / Palestine Parks & Recreation Department. 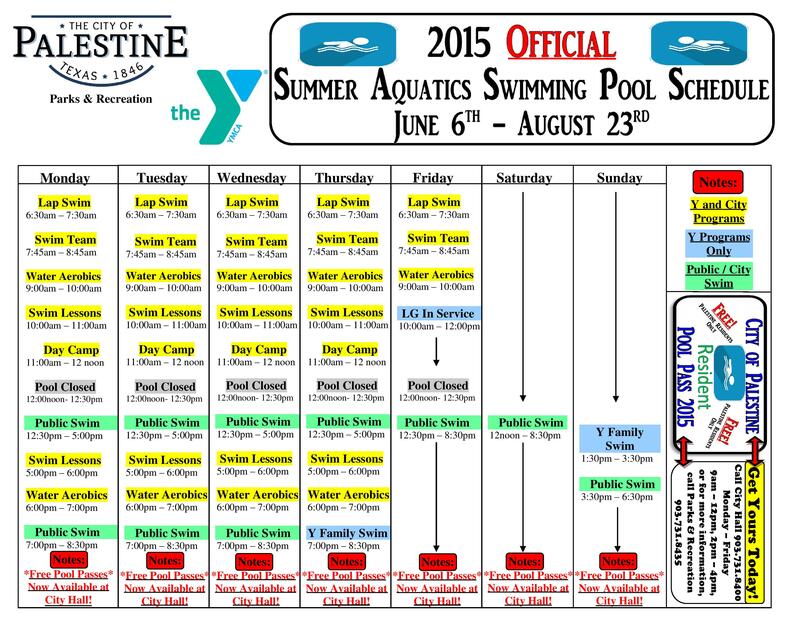 2015 Pool Schedule – Special Dates and Hours / Holiday Hours. CLICK TO ENLARGE. Image courtesy of The City of Palestine / Palestine Parks & Recreation Department. Check out the calendar to see the variety of swim / water aerobics classes offered at the pool. Check with the YMCA for full class offerings and registration. Lisa E. Priest is obsessed with all things summer and is a Palestine, Texas REALTOR® and Property Manager with Picket Fence Realty, Inc. You can reach her via phone or text at 903-948-3343 or read more at BuyPalestine.com.